So far, I've written two Steampunk/paranormal/adventure novels, Carpathia and The Devil's Harvest, that feature — I hope readers would agree — the thrills and excitement of an Indiana Jones movie as the good guys and gals battle undead creatures like vampires and zombies. While that's what I've written, on the other end of the page — so to speak — I enjoy reading from a wide variety of genres. A sampling of the best I read in 2012 include a sci-fi/horror story set on an isolated space station, a historical story about the Irish Republican Army and an urban fantasy with a magic user fighting against dark forces in — of all places — Rochester, New York. Somewhere in the back of my mind I recall a quote from Stephen King in which he states that the two more important things every writer should do is read a lot and write a lot. No surprise, but I wholeheartedly agree: reading widely is a like a training program for writers to see how your peers handle plot points, develop characters, paint a word picture of a scene, etc. (It goes without saying, of course, that direct copying is wrong ... experience, learn, be influenced, but write your own words and stories). Side note: Remember when Stephen King first hit the literary scene? He was lambasted as a hack, churning out low-brow chum for the masses like modern Penny Dreadfuls. Millions and millions of books sold to a vast legion of diehard fans and today he is an important force on the literary scene, although King still has not gained the respect of the 'smart set' (to wit: he has made the New York Times "10 Best Books of" list just once, in 2011 for 11/22/63). Still, who among us would not *love* to get a positive endorsement of our work from King? Or John Grisham (personally not a fan, but can't not respect the achievement), Michael Connelly, or J.K. Rowling? Anyway, as I was saying: reading widely from different genres is important and helpful, but what about the subject matter we write about? In the lead paragraph above I used the words 'so far' because I do have ideas for stories in other genres: crime, dystopian, sci-fi, fantasy. Of course, there's no telling I won't sit down to write a story in one of those other genres and suddenly the setting shifts to an alternate history like 1880s Romania similar to Carpathia or WWI France like The Devil's Harvest. Perhaps an airship appears ... or a vampire .. or a zombie. I could be fooling myself that I'm anything but a writer of novels like the two I've already completed. There's no telling, but there's no reason to be worried about it, either. First off, I'm writing stories that I would want to read, but more importantly I know my imagination is bigger than any single genre. My two novels are not merely Steampunk, not merely Paranormal, not merely Adventure, not merely Historical ... they are a bit of all those and more. In fact, the third book of the series looks like it will be set in 1950s Chicago during an organized crime turf war. A turf war between some mobsters and werewolves, no less, with perhaps some Cold War intrigue involving Russian spies and nuclear weapons research thrown in for good measure. Or maybe it will be something else. I'm never exactly sure until I start writing. Read widely and your imagination will broaden as well. I firmly believe that. And if you, dear Reader, are looking for a new genre or genre mash-up to explore, may I suggest Steampunk/Paranormal/Historical adventures? I happen to know a couple books in that niche I could recommend. You can't blame me for trying, right? Born and raised in the Midwest, Scott Whitmore turned to writing after 20 years of service in the US Navy. 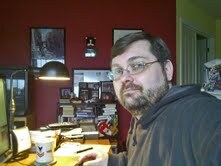 He has written for The Herald, a daily newspaper located in Everett, Wash., with a circulation of 45,000. He has also contributed to Sports Northwest magazine, SBNation.com, and Racing in America. Scott currently works as a freelance writer and marketing consultant, specializing in motorsports. He wrote and published Short Track Saturday Nights, a book about the 2008 racing season at Evergreen Speedway, Washington’s only NASCAR home track. His novels, Carpathia and The Devil's Harvest, are available at Amazon.com.